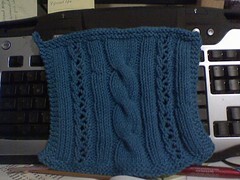 Woo hoo my first attempt at cables and I must say I really enjoyed doing it. Of course this was an easy one. This is the cables & lace cloth from the Creative knitting magazine. It's done in Sugar n cream yarn. It did take me a little time getting used to manipulating the cable needle. I still am not sure which cable needle I like best. One day i want to learn how to cable without a cable needle. My cast on edge seems to be a bit loose but overall i REALLY liked this cloth and may do more of them! Well actually the pig was done about a month ago but i'm just getting around now to blogging it. This was my first knitted animal. As you can see from the picture i messed up on attaching the nose. I don't like embroidering so i omitted the mouth and I used plastic eyes. Wow I didn't realize that I haven't blogged in a long time! For a bit I was in kinda of a knitting slump. But I finally picked up my needles and started again. 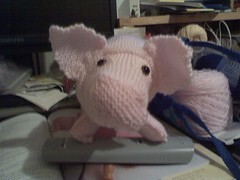 I did finish a pig for Alysia. The pattern for the pig came from Knitted Toys by Fiona McTague. I'll share pix of the pig later on. I also made the mistake of letting Alysia browse through the book so now my "to-do" list has grown quite a bit. I am currently working on 3 projects and they aren't dishcloths! I'm working on 2 designs from White Lies Design. One is the easy lace jacket and the Child's Secret Garden Cardigan. I am also working on a tank top from Cabin Fever. These are my first projects for myself and that are more complicated than dishcloths.